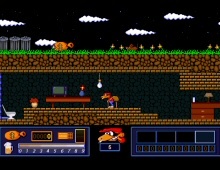 Goody Remake, as the name implies, is a modern Windows-based remake of Opera Soft's classic Spanish action game of the same name. From my review of Goody elsewhere on this site: "Goody is a fun 2D action/adventure platformer from Spanish developer Opera Soft. You play a small thief bent on robbing a Spanish bank. Before embarking on this venture, you’ll need to find appropriate tools for the job, including torch, pincers, etc. Once you gather all the necessary tools, you will be ready to launch the crime. But things are not as easy as they seem, of course. Along the way to the bank, you will have to avoid or deal with policemen, gorillas, kung-fu experts, weeping women, paper airplanes, and other obstacles in your way. Anyone who likes Codemasters’ classic Dizzy series will probably enjoy Goody. It is a fun game in the “video adventure” 2D action/adventure genre that was very popular in Spain in the 80s – 90s. While the game is a traditional adventure in that you need to use inventory items in the correct places, it also requires the same combination of good reflexes and timing as typical platformers do. Sharp cartoon graphics with a lot of detail (even with the limited 4-color CGA palette), smooth animations, fun puzzles, and a charming atmosphere makes Goody well worth a look for action and adventure fans alike. Two thumbs up, way up!" This 2005 remake sports excellent SVGA graphics, sound effects, and addictive gameplay that is completely faithful to Opera Soft's original. Highly recommended.